To bring the history of media full circle into the present day, the world of international policy finds itself poised in a place very similar to where it began in ancient times, a place where clever imagery and iconography has returned to the center of public life. 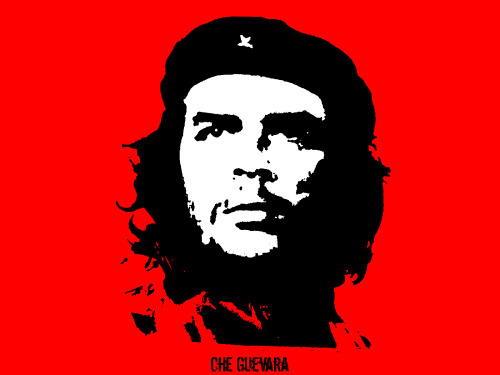 This is best embodied by the career of graphic artist Shepard Fairey. Although today mainly a commercial artist that diverts a portion of his time and money to philanthropy, the original project that rocketed Fairey to success, better known as the “Giant Manifesto,” was a social experiment carried out by him and some of his friends in 1989 while still a student at Rhode Island School of Design. His goal was to identify how the mind turned images into symbols of greater meaning. Fairey was intrigued by the amount of imagery in 20th century America that was designed with a planned commercial or political message for its viewers. This intrigue manifested itself in a project where he chose to explore what effect a mass-circulated image absent any planned meaning would have in a public setting. 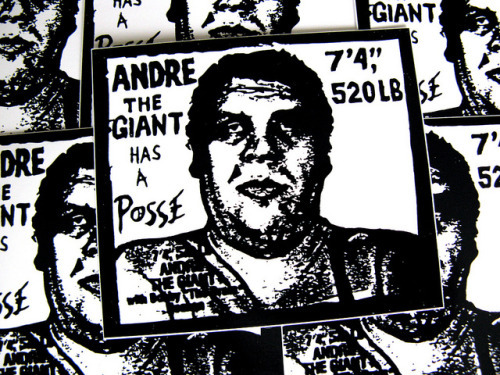 He did this by creating a basic stencil of 80s cult figure Andre the Giant’s face, with the caption “Andre The Giant Has a Posse” placed next to it. The face and caption were deliberately vague. Fairey and his friends spent several days secretly printing and putting up the stickers around their campus. Within days, numerous articles appeared in his school’s paper, theorizing what the stickers were all about. Fairey continues the project today by putting up the image in major cities around the world and putting it up online (along with instructions for how to cut it into a stencil so others can help him place it in public spaces). He has since simplified the image and changed the caption to just the word OBEY. The more that the sticker has been circulated, the more that people have detested or desired the sticker, in both instances demanding to know the story behind it. The result of Fairey’s experiment, aside from making him an internationally recognized as both a street vandal and a professional artist, was evidence that people assign importance to images as they are repeated, regardless of their message or lack thereof. Whether a creative accident or a brilliant marketing ploy, millions of people around the world have purchased products, donning Fairey’s OBEY icon, along with many of his other prints. 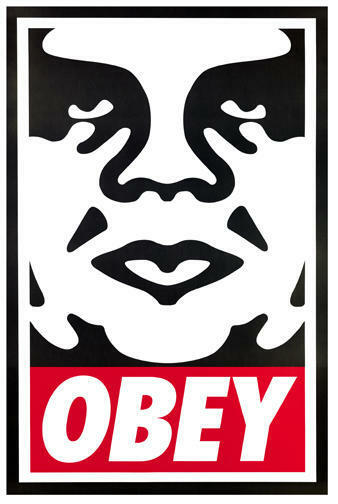 The famous OBEY icon now appears legally on T-shirts and posters, along with illegally on just about every form of defaceable public space imaginable. Fairey’s original “Giant Manifesto” is posted on his website. Although the world of street art does not immediately line up contextually with the state of modern media, Shepard Fairy’s project brilliantly demonstrates image saturation’s ability to legitimize ideas in the brain as one of the most important aspects of the Internet age. The Internet and the cheapening of recording technologies not only allows individuals the ability to circulate unfathomable amounts of information to an audience of billions, but also creates a fresh testing ground for new creative forms of human interaction.In an era where global networking is a norm, the chance for creative new forms of communication to reach the forefront of media has opened up in a way not seen since the coins of Alexander the Great’s Macedonian empire.Like in the time of Macedonia, mass-circulated iconography serves people today with the same goals of to legitimizing policies, figureheads, and institutions, as well as every day individuals. Multifaceted integration of text and imagery online in the formats of official websites, video clips, and social media outlets like Facebook and twitter are as critical to the success of a leader today as good public speaking skills are. But Shepard Fairey is neither a politician, nor the head of any major institutions, and when he began his Giant Manifesto he was not someone of substantial wealth. Despite all of this he was still able to gain international notoriety through his tactics of image-saturation. This would not have been possible, or it would have been a much slower process without a modern world that is overflowing with printers, camera phones, laptops, and broadband access. A computer with Internet capabilities gives anyone who is able to produce something of interest access to a world audience, regardless of who they are or what their message is. This new empowerment of individuals simultaneously democratizes the media industry while also polluting it with massive amounts of information with inconsistent levels of quality. Given that this has all only occurred in a few short years, no one is certain what all of the outcomes of this phenomenon will be.What is already certain, however, is that like at any point in history, leaders who have embraced changes in mass media have been far more successful at accomplishing things than those who have not. So far America’s most successful politician to do this during the Internet age has been Barack Hussein Obama. 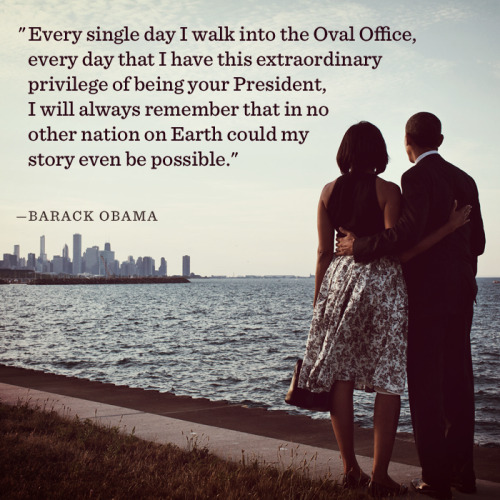 If you look at Barack Obama’s Facebook page, you will see that he has more than thirty-five million “likes,” meaning that there are 35 million people who use Facebook that instantly receive news about Barack Obama from his public relations team. Considering that around sixty one million people voted for Obama in 2012, the number of people that follow him on Facebook proves substantial to say the least. Interestingly enough, Mitt Romney only has around twelve million Facebook followers.Just Facebook alone gives Obama space where he can not only instantly update what is probably over half of his voting base with his latest speeches and policy decisions, but also lets him make public appeals online for his causes just as other presidents have done in the past with radio and television. Also, unlike a cable news channel, everyone tuning in to Obama on Facebook is getting updates from him because they have subscribed to them, not because he happens to be on the nightly news.Also unlike radio and television, a Facebook page is far less constrained by time slots. It employs every aspect of the written word and the audiovisual experience in a continuous stream of media that is viewable to anyone at their own convenience. Many updates on Facebook are also not policy related, but more social in nature, allowing individuals to assign a personal meaning to a given piece of vague imagery or text, just Like Shepard Fairey’s OBEY sticker does. Regardless of whether one believes the messages in these images to be sincere or not is not of consequence when it comes to gaining notoriety. They are effective tools, often with many thousands of people commenting on them and sharing them to their Facebook friends. Another major advantage of online social media is the access it grants to younger voters, a demographic that Obama has carried by large margins in both of his presidential elections. Young people of voting age are much more acquainted with the Internet than older generations and to no surprise are the primary users of Facebook, twitter, and most other large social media outlets. 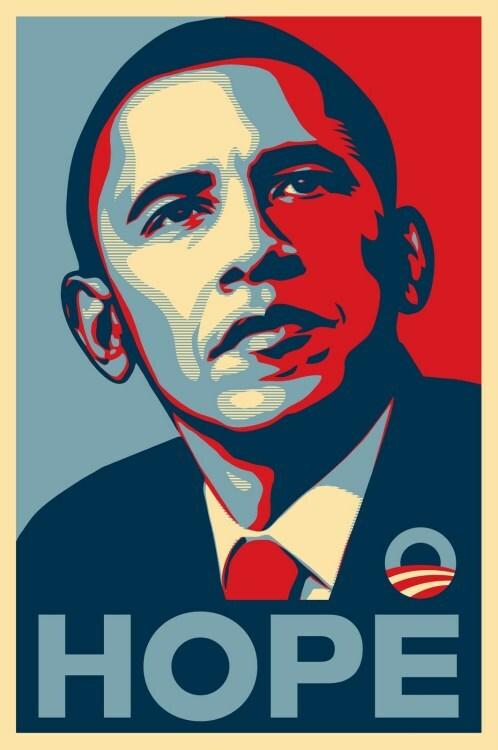 A strong presence on social media is a better way to reach the youth vote than on older technologies, which younger people spend less time using.One of the first pieces of iconography to be associated with Barack Obama was actually a poster created by none other than Shepard Fairey in 2008. Made in one day from a photograph taken of Obama as a senator, Fairey’s image was circulated online en masse and was eventually adopted by the Obama campaign, where it was put onto shirts, cards, mugs and various other paraphernalia. It remains one of the most well known images to be associated with Barack Obama and to many solidified him as an icon in popular culture.With an aesthetic that embraced graffiti art and the rebellious associations that come with it, the image did much to assert Obama as a progressive candidate who was in touch with the thoughts and feelings of a younger generation. Shepard Fairy’s poster also bears strong similarities to revolutionary iconography employed by artists like Jim Fitzpatrick of the 1960’s. Obama’s victory in 2008 was of course not the result of any single poster, promise, or Facebook post, but the fact that his campaign communicated with voters through multiple media formats, particularly online, is one of the main roots of his popularity among younger voters. But if Obama and his campaign were efficient at using the Internet to craft a strong public image for him, the campaigns of his opponents proved less effective at doing so. The Romney campaign in particular encountered the negative side effects of what happens when public statements are not coordinated with one another in the Internet age. Presidential hopeful Mitt Romney came off strong in the first presidential debate between himself and Barack Obama during the 2012 election, but unfortunately was not nearly as poised in other situations. During his visits to Britain and Israel in the summer of 2012, he did much damage to his reputation internationally by offending the British press when he questioned the preparedness of London for the Olympic games during a casual interview. He received a hostile response from both Prime Minister David Cameron and London Mayor Boris Johnson, who both included insults to Romney in televised speeches, all of which quickly hit blogs, tweets, Facebook posts and eventually the British and American mainstream media. Romney made the same mistake again in Israel, where aggressive rhetoric while discussing the GDP disparity between Israel and the West Bank gave the impression that he believed Israel to be culturally superior to Palestinians. We may never know what Romney actually believes on the subject, but it matters little. Regardless of his actual opinion, his fumbling of words came off poorly in the world press, where he was swiftly reprimanded by not only his opponent back in the states, but also many prominent human rights groups and world leaders. What was certain was his assertion that he saw the Palestinians as culturally the more hostile group, saying “They have no interest whatsoever in establishing peace,” and called a two state solution “almost unthinkable to accomplish,” infuriating people in the region and upsetting Muslim Americans at home. The embarrassing incidents in both London and Jerusalem severely damaged Romney’s credibility internationally. Even if he had been elected, Romney would’ve begun his presidency in an international community where many already held him in a largely negative light. This and his now famously camera phone-recorded speech to conservative benefactors calling 47% of the American population lazy were part of the demise of the Romney campaign, where the percentage of American voters who turned out for him ironically turned out to be 47%. Thanks to the Internet and also 24-hour news, lightning speed communication around the world that can lead to generalizations are also not only limited to Politicians. Individuals, from terrorists to cartoonists, can suddenly be validated or condemned at the flip of a channel and the click of a mouse. Perhaps feeling anxiety until we learn the story is a basic survival instinct?